So I was putting some old summer clothes and shoes away in the loft the other day when I came across a bag of clothes I thought were gone and forgotten! 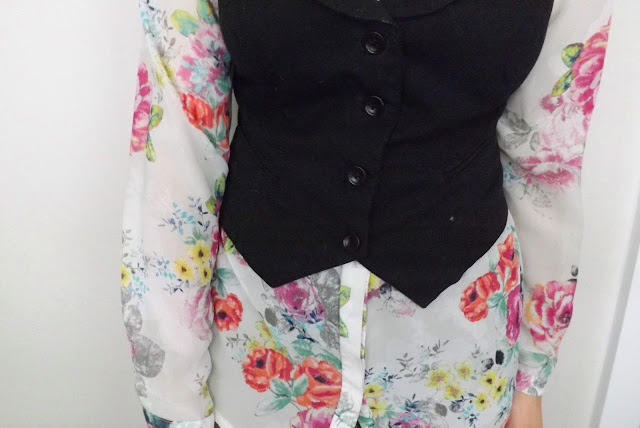 I not only found both my uni hoodies which I have religiously worn in replacement of all chill out jumpers and a couple of pieces that could be great for work including my new found waistcoat! I was given this waistcoat as a present quite a while back. I believe I could have either been 18 or 19 at the time. I wore it a lot then and I don't know why I put it away. And after seeing the 'Bin of Sin' episode in Pretty Little Liars's Season 5 where Aria (Lucy Hale) wore THIS awesome outfit. 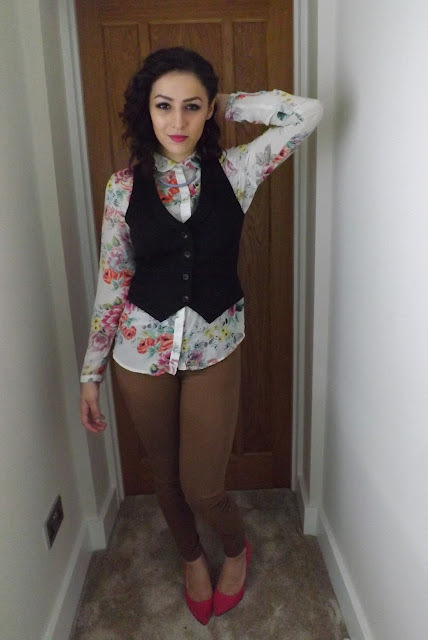 I was so inspired by this look and loving it so much, it reminded me of the waistcoat that I had and wanted to find it. Thinking it was lost, I'd been in search of a new one. I thought I wouldn't find a fitted one because during my time in retail, I hadn't seen one once. Every waistcoat would be too oversized or too long as far as I knew. 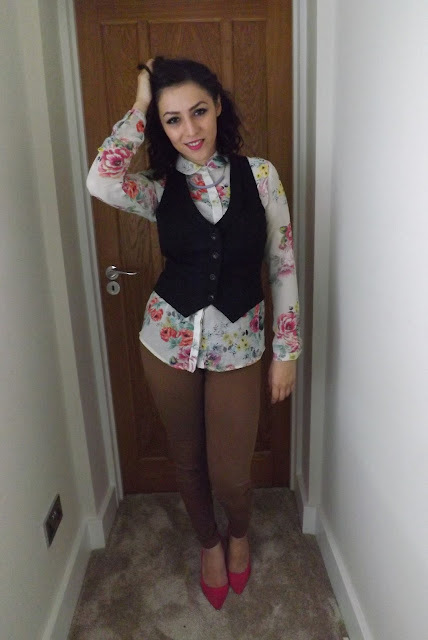 So you couldn't imagine how happy I was to find this and be able to wear that Aria inspired look! I jazzed it up a bit with my favourite brightly coloured pink courts and though this camel colour doesn't go very well with black, I thought it didn't clash enough to ruin the outfit. 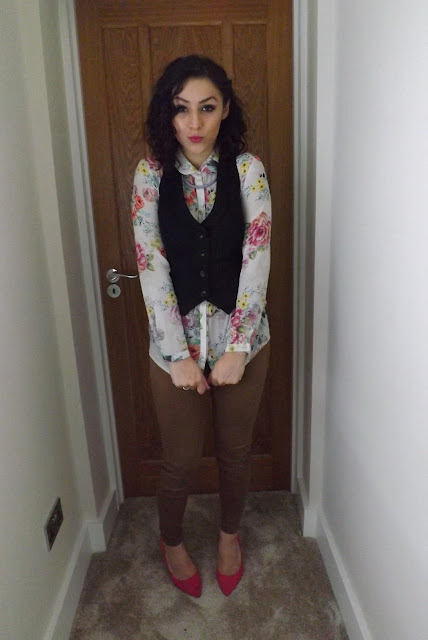 I love the shirt with these trousers simply because they're such a good combo, and with the shoes it really brings out all the colours in my floral shirt too. I can't help it, I can't wait to wear my waistcoat some more now I've found it! Love your outfit! 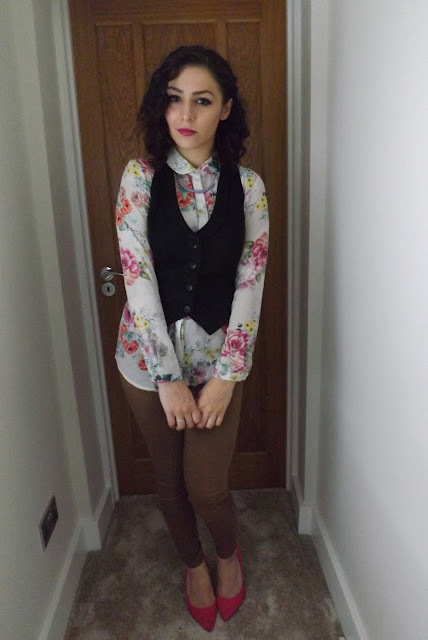 The waistcoat looks great and the shirt with the shoes are awesome :) Aria is my fav!